Who does what, for whom and for when? The human resources assignation module: an essential tool. The client has just sent his order and there is a lot of excitement at the company. Indeed, the project is very ambitious and is going to require most of our employees over a long period of time. We are Epsilon Conseil (*), a SME specialized in professional services. We deliver projects which are mostly far different one from the other. Indeed, some of them last over a short period of time and involve a limited number of employees and others, on the contrary, are larger scale projects. This kind of large project represents a primordial interest for a SME because it generatesrevenue that we cannot miss. However, it can be risky. Delays on delivery resulting in possible penalties. Work overload for employees and progressive demotivation. Risk of exceeding the initial budget that was used to calculate a fixed price. Risk of loss through under-billing. The project requiring much of the workforce, there is a bottleneck risk when obtaining other projects during the delivery of the project in question. If many people are involved in the project, some tasks may be duplicated and, therefore, affect the profitability of the project. In the meantime during which the project is active, what other projects are in the pipeline? Which impact would have those ongoing projects in terms of staff mobilisation? What would be our flexibility in case we would win new projects during the considered period? How to deal with the delays and their impact on the following projects? The evidence is there: the solution is a planning tool which is integrated not only to the application that controls the working time but also to budget control reports, and other project monitoring reports (work in progress, expenses management, and billing). Abak software Inc. proposes a resources assignment tool. There are several ways to assign employees to projects. It is possible, when building the project architecture in Abak, to assign several employees for a given period and for a specific number of hours per day during which the employees will work on the project or to assign employees to a specific activity for example. 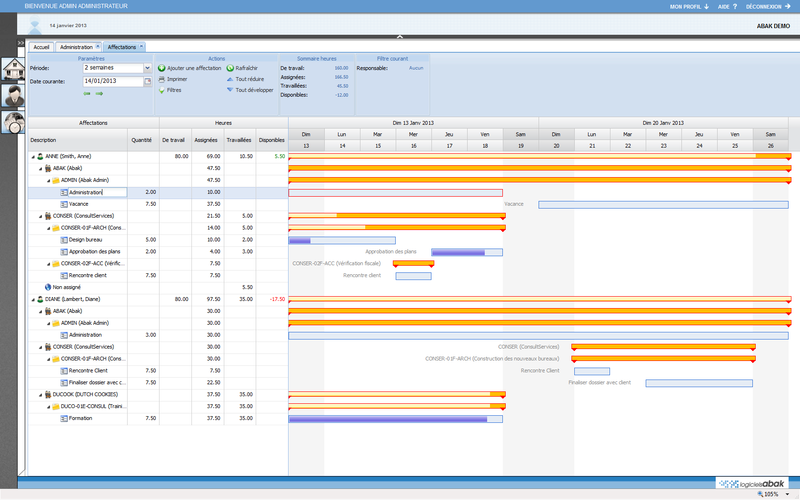 This results in a monitoring table, Gantt type, which offers an overview of everyone’s time, and determines the level of availability of employees for a given period. The assignment module includes a detailed report as well. Depending on the selected criteria and the employee’s assignment, this application will be able to track the progress of projects and the remaining availability of resources. (*): Any similarity with the name of an existing company is purely coincidental. Just got back from holidays? Welcome back ! Do not miss the opportunity to discover the new functionalities of Abak 7.6. Follow the guide during our free webcast on January 10. Discover Abak 7.6. and especially the new functionalities brought to Abak Web.